If you are going to Sabah and would like to scale Mount Kinabalu, a UNESCO World Heritage Site, it is always a good idea to train your fitness at home before coming here. Running, jogging and climbing up and down steps are some of the exercises you can do to keep yourself fit and ready for the challenge. Your destination is to reach the summit known as Low's Peak at an altitude of 4095.2 m above sea level. This summit was named after Sir Hugh Low, a British administrator during the colonial time. Even though the peak of Mount Kinabalu is your destination, take time to enjoy the flora and fauna along the way. Make sure you book in advance as Sabah Parks only issue 135 climb permits a day. Camera or Video Camera is a must to capture the panoramic view from the mountain. Place them in water proof bag in case it rains. There are plenty of flora and fauna to discover as you go up the mountain. Binoculars will come in handy when you need to take in the view from a distance. Warm Clothing is needed as the temperature continues to drop as you go up the mountain. The temperature at the summit is near freezing. Bring along also Wind breaker, long sleeve shirts, towels, socks, tissue paper and additional clothing for changing. Walking Shoes with good traction is a must as certain stretch can be slippery especially when there are mosses growing on the stones' pathway. Mineral Water is a necessity and energy giving snacks such as raisins, chocolates and nuts will help you along the way. Torchlight that can be strapped on the head is necessary as you will be moving on the trails when the sun has yet to rise. Insect repellent, sun block lotion, paracetamol and basic first aid kit will come in handy when you need them. There used to be two trails that you can opt to use to go to Laban Rata. 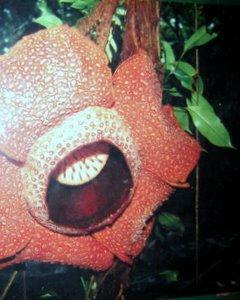 They are the Timpohon Trail or Mesilau Trail. However, due to a flood in 2015, Mesilau Trail is now permanently closed. Hence Timpohon Gate Trail is the only route that can be used to go to Laban Rata. The first day's destination is to arrive at Laban Rata Resthouse(3,270 m) and rest for the night before going up the summit early morning(2:00am - 2:30am) the next day. The hike from the base of the park headquarters to Timpohon Gate(elevation of 1866m) will take approximately 1 hour. You can also take a mini bus from the Kinabalu Park HQ to Timpohon Gate for RM15/person. The distance to the summit from Timpohon Gate is about 8.72 km. 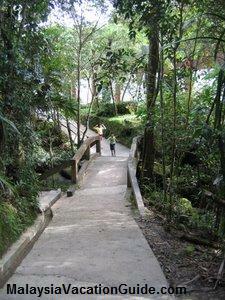 You will pass by Carson's Fall enroute to Layang-Layang where the staff quarters are located. The journey from the Gate to Layang-Layang (2621 m) is approximately 3 hours. There are huts every half an hour or so to enable you to rest your tired legs if necessary. The 7 huts that you will pass by are called Kandis Hut, Ubah Hut, Lowii Hut, Mempening Hut, Layang Layang, Villosa Hut and Paka Hut. 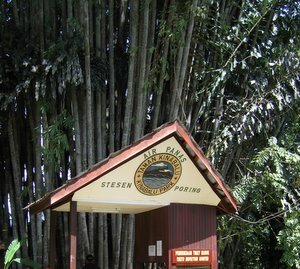 Pondok Paka or Paka Hut is about 2 hours away from Layang-Layang. Hike for another hour or so and you will reach Laban Rata Resthouse. Look out for plants such as bamboos, conifers, orchids, ferns, pitcher plants, wild begonias and rhododendrons along the way. Take some pictures as these plants are not so common at the low lands. Watch out also for birds, squirrels and other wildlife. 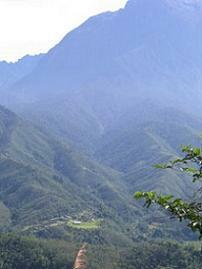 At Pondok Paka which is 3,053 m above sea level, you will be able to see a spectacular view of the mountainous region. Laban Rata has all the basic facilities for you to stay for the night. Water, electricity, restaurant, hot showers, toilets and heaters are available to ensure that you have a good rest. After a few hours of sleep, the journey to the peak starts at 2:00am to 2:30am the next morning. The reason for the early start is to enable you to catch the sunrise at about 5:30am. You will be moving in total darkness except for the torch lights. Ropes and ladders are provided in stretches that are steep. You can use the New Ranau Trail or Kota Belud Trail to go the the summit. Both of these trails will meet at Sayat-Sayat checkpoint at an altitude of 3668m a.s.l. The air becomes thinner with less oxygen as you scale up towards the summit. Some may decide to turn back due to breathing problem. It will take about 3 hours hike to reach Low's Peak at an altitude of 4,095.2 m. Remember to take lots of photographs from this height. A stunning view is your reward for all the effort taken. Take some time to enjoy the sunrise and rest your tired legs. Descend and purchase your certificate for RM10.60 as a momento of your achievement. See a good video of scaling Mount Kinabalu. If you want to experience the scenic view of mountaineers, you may want to try the via ferrata, a protected mountain route which consists of a steel cable along the route. It also has other climbing aids such as iron rungs and pegs embedded on the surface of the rocks besides carved steps and bridges to aid your movement. 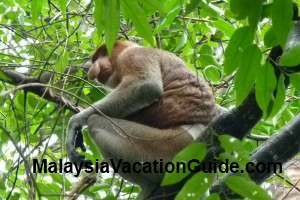 There are two via ferratas that you can try while you are climbing Mount Kinabalu. Walk The Torq which is at an altitude of 3520 m above sea level with a route length of 430m is simpler and easier to do. It takes 2-3 hours to complete and is ideal if you are a beginner to rock climbing. You need to be at least 10 years old and 1.3m tall to do this. Low's Peak Circuit highest peak is at 3776 m above sea level with a route length of 1.2km. It takes 4-6 hours to complete and is more challenging. If you take this circuit, you will also be doing the Walk The Torq. You need to be at least 17 years old to do this. Watch the video of Low's Peak Circuit via ferrata to decide whether this is for you.. Most climbers take climbing packages at Kota Kinabalu and the fees are already included in the packages. Entering Kinabalu Park fee is RM15/adult and RM10/child(below 18 years old). Climbing permit is RM200 per adult and RM80 per child. Malaysians pay RM3/adult and RM1/child to enter Kinabalu Park and Climbing permit of RM50 per adult and RM30 per child. Insurance coverage of RM7 per person is compulsory. Porters can also be hired to carry your bags with rates ranging from RM65-RM80 per porter for a maximum of 10kg. Additional weight will be charged. All these are to be paid at the park headquarters before you start your climb. Guide fee of RM230 with ratio of guide to climber of 1:5 for adults and 1:2 for climbers below 16 years old is compulsory to scale the summit.